Blink and you’ll miss it – hidden amongst the city’s myriad of bustling restaurants and booming shopping centres nestles Cardiff’s own warm, cosy haven. Step off the busy streets of The Hayes and lose yourself in Cosy Club’s warm and welcoming air; indulge in its enticing array of comfort foods; and watch the world go by beneath you through its magnificent second storey glass walls. Unlike so many of Cardiff’s restaurants, Cosy Club offers a dining experience that meets your every need. Food is served all day every day from 9am – 10pm, with an array of menus and deals to suit every occasion. Feeling fragile after a fast-paced Monday in the city? Pop in for your choice of any main, burger or salad, and receive a free drink from 5pm onwards during the club’s Marvellous Mondays – add any pudding for £3 if your Monday has simply been too much to handle. Cosy Club’s extensive brunch menu, served until 6pm, sets the stage for the perfect family outing as the conversation flows in this homely environment. Why not book a table for your long-awaited reunion with old friends over a delicious lunch? 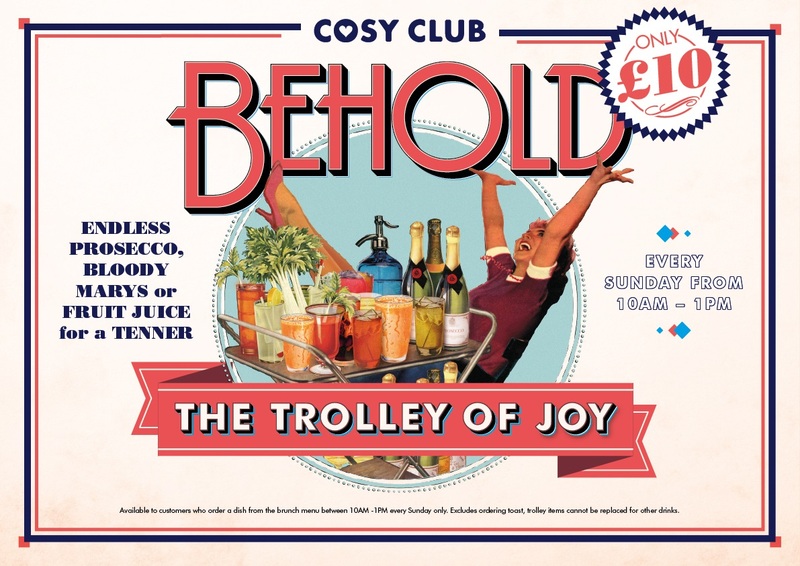 Let the Trolley of Joy make it an extra special occasion with endless cocktails, Bloody Marys or fruit juice for only £10 from 10am – 1pm on Sundays. You’ll struggle to find a more intimate atmosphere for your evening meal than that which envelops Cosy Club by night, surrounding not only its snug dining area but also its inviting bar area. Take your pick from the traditional menu or venture into the fine selection of tapas. On Tapas Tuesdays, order any 3 tapas dishes and a glass of house wine for only £11.95 from 5pm onwards. Top off your evening with their range of bespoke and classic cocktails, such as the Pin Up Martini and the Cherry Bakewell Cocktail. Take advantage of Cosy Club’s new Teatime Tipple, offering any two cocktails for just £9.50 from 4pm-7pm every Monday to Friday. Open all week from 9am to 11pm from Sunday – Wednesday and 9am – 11:30pm from Thursday – Saturday, Cosy Club offers a wide range of ways to get cosy and provides a fresh and unique dining experience with each visit. Though this diversity certainly explains its increasing popularity, the burning sense of exclusivity which Cosy Club seems to embody certainly isn’t lost upon the city either. By virtue of its name, the restaurant suggests that behind its sleek glass doors lies an element not to be found elsewhere: something which only those who have sat around its rustic tables, drinking mystery brews in perfectly lived-in leather arm-chairs know. Walk through the threshold of Cosy Club into its grand entrance and you’ll immediately understand how it continues to pique the interest of curious crowds of restaurant-lovers: its warm, autumnal colour scheme, the effortless equilibrium of old and new, and its dedication to comfort above all else – these are the main ingredients to meet the burgeoning need of modern consumers for an all-encompassing dining experience. With its seamless combination of chic interiors and a laid-back ethos, Cosy Club meets this criteria with ease and attracts swathes of diners who keep coming back for more. Planning ahead? The Club’s Festive Feast invites you for a marvellous Christmas dinner – crackers and laughter included – from the 28th November to the 24th December. 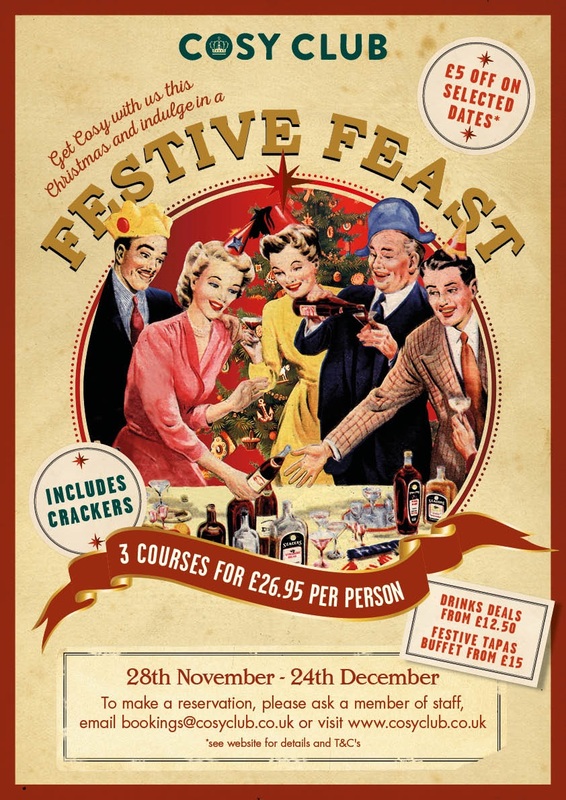 For only £26.95 per person, enjoy a splendid 3 course meal to get you in the festive spirit. As much as we can describe this hidden gem in Cardiff’s restaurant landscape, it must be experienced to be truly known for all it is. Visit their website, www.cosyclub.co.uk/cardiff, contact cardiff@cosyclub.co.uk, or call 02920 225998 to book your table now.